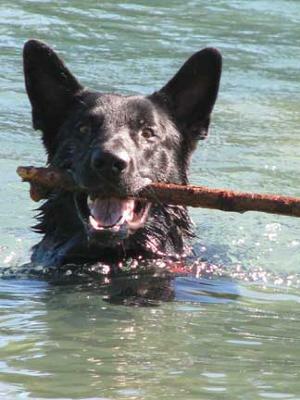 Kohl, my 1year old male Czech german shepherd retrieving his favourite stick. His stick collection is his purpose in life and there is NOTHING he won't do for a stick!! once he has selected a stick (or whole tree as is sometimes the case) during a walk there is no giving in, he will bring it back to the car some way or other to bring home. Fortunately,with some negotiation,he will allow said stick to be reduced in size to fit the car but will not go home empty handed!! I have never owned such an intelligent(and cheeky)dog! !